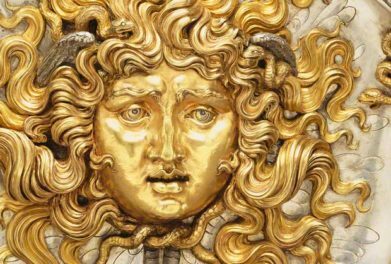 Syria is a singular treasure trove of numerous phases of world culture—Bronze and Iron Age, Classical, Byzantine, Early Islam, the Crusades, and the great cultures of the Islamic Middle Ages as well as the Ottoman centuries. It brings together a more representative sample of these cultures than perhaps any other country. Moreover, it shows these cultures interacting in a way that is seen in few other regions. 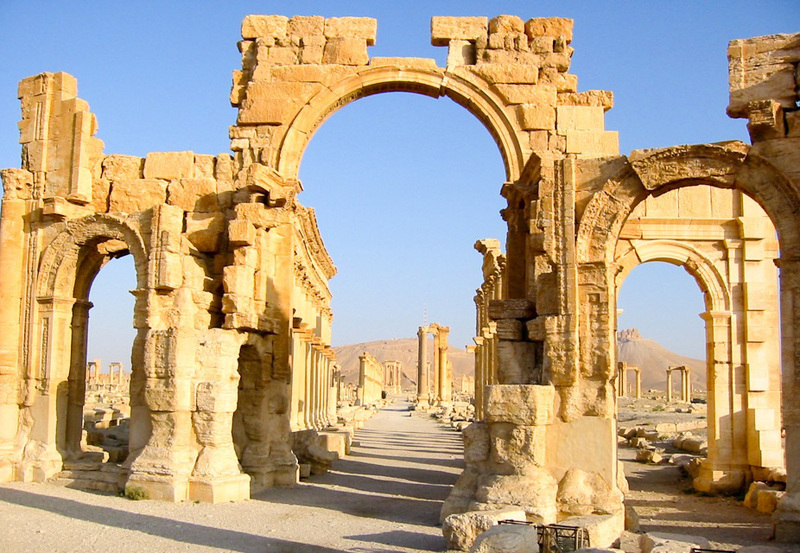 The present conflict in Syria has since 2011 brought many of the country’s great range of monuments and archaeological sites within range of one of the most intense and sustained conflicts the region has ever seen. Much attention has been paid to how much has been lost as a result, perhaps initially stimulated by the world’s reaction to the sacking of the Baghdad Museum in 2003. While reports are sometimes exaggerated, and taken out of context, the toll of damage has been considerable. Some of the country’s most spectacular remains have been deliberately destroyed while many more have been lost in the heat of battle. Two cities have suffered particularly, but from rather different aspects of the conflict. In Aleppo, the fact that the initial lines of confrontation between the Assad regime and its rebel opponents centered on the zone in the middle of the historic walled city brought a heavy concentration of damage. As a result, much was lost in the heat of battle, with the government forces occupying the Ayyubid fortifications atop the citadel and the rebels adopting firing positions deep within the alleyways, mosques, and madrasas of the old city at the foot of the citadel. A totally different pattern of destruction was visited on Palmyra upon its occupation in mid-2015 by the forces of so-called “Islamic State” (IS). 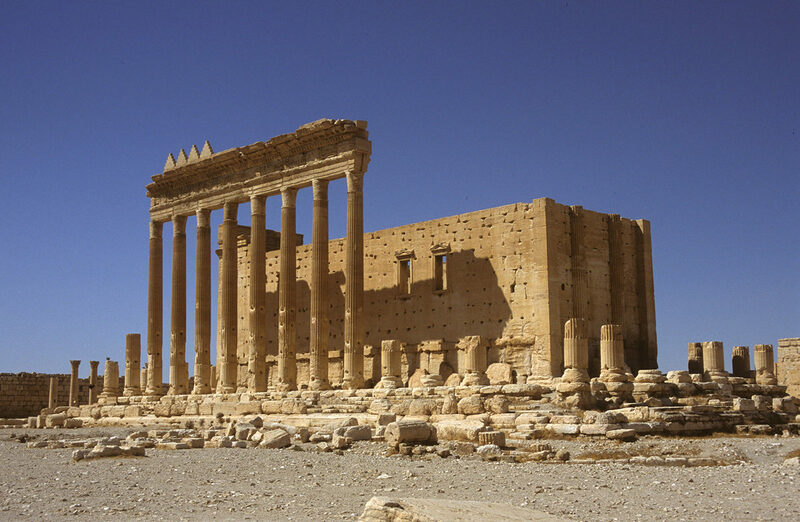 The occupation of the modern town of Tadmor and the extensive classical ruins of ancient Palmyra was intended from the start to enlist monuments as weapons of war. Choosing the most iconic and intact of the remains of the great desert trading center, once poised between the Roman and Parthian/Sasanian empires, IS explosives experts proceeded systematically around the city destroying all the buildings which were either the most intact, the most richly decorated, or the most offensive to their Salafist ideology. The IS rampage began with two Islamic saints’ tombs and proceeded to destroy two of the city’s most spectacular temples of the Roman period—the Temple of Baalshamin and the central shrine of the great Temple of Bel. In later stages, the IS experts detonated most of the structure of the city’s Monumental Arch and some twelve or more of the most intact of the beautiful tower tombs, which had stood like sentinels on the fringes of the Roman-era city. This campaign of obliteration was accompanied by other measures to drive home the message of IS’s “stop at nothing” campaign of destruction, which extended to the staged execution of Syrian officials, of recalcitrant townspeople, and of the notable Syrian scholar Khalid al-Assad, who had spent his career of fifty years in the city. Khalid al-Assad had been responsible for the presentation of what had once been assumed to be a “one-period” (Classical) site as part of a continuum of cultures extending well into the Islamic Middle Ages. This message of a mingling of cultures across millennia was clearly not what IS wanted to hear, and al-Assad was brutally executed by IS’s favored method, beheading. IS’s final gesture was to ransack the beautiful archaeological museum in Palmyra. Though much was rescued before IS’s arrival by the dedicated staff of the museum and the Directorate General of Antiquities and Museums in Damascus, a range of larger pieces fastened to the walls could not be removed in time. Some of the most precious of the museum’s sculptural finds subsequently defaced or smashed included numerous limestone busts and a singular statue of Athena (a Greek marble found in pieces in the 1950s and restored by the expert work of its Polish excavators). The sacking of Palmyra and the imposition of a Salafist code on its citizens were gleefully signalled in IS propaganda as a demonstration of their ruthlessness. After the site was regained by Syrian forces in March 2016, it was adopted by the Syrian and Russian propaganda machinery as a symbol of the country’s expected regeneration, but little could be achieved in the light of a continued IS presence in the region. IS forces retook the largely depopulated city again in December 2016. This time they have not exploited the ruins to launch a renewed propaganda offensive, but satellite imagery has revealed a resumed pattern of quiet destruction targeting the Roman theater and a magnificent Tetrapylon structure that marked a flexing of the city’s great colonnaded axis. 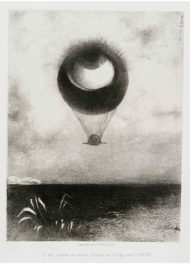 It too had been restored under Polish supervision in the 1960s. Whether IS consciously sought to destroy as much of the city’s blend of Roman and Eastern influences as could readily be reduced to rubble or simply wanted to develop a spectacular example of their methods to terrify Syrian and international audiences into backing off any campaign to defeat them is not clear. Clearly, however, the ruins of Palmyra were seen as weapons of war not in any physical sense but in terms of a psychological battle which IS saw as one of its chief fronts in the conflict. The Salafist mind clearly sees any depiction of human or animal figures, any commemoration of the dead with monuments to their memory, and any shrines of “pagan” origin as fair game—as seen by the pattern of destruction they have left in their wake across Syria. Aleppo, too, suffered from the inclination of other Islamist forces to use spectacular acts of destruction as a measure of their supposed prowess. Central Aleppo was not occupied by IS, but other Islamist forces joined in the “Islamic Front,” a grouping sponsored by Gulf interest groups, which set to work to reduce a section of the most symbolic buildings of central Aleppo to ruins in late 2014. Their methods were even more effective than IS’s bombing experts’ repertoire. 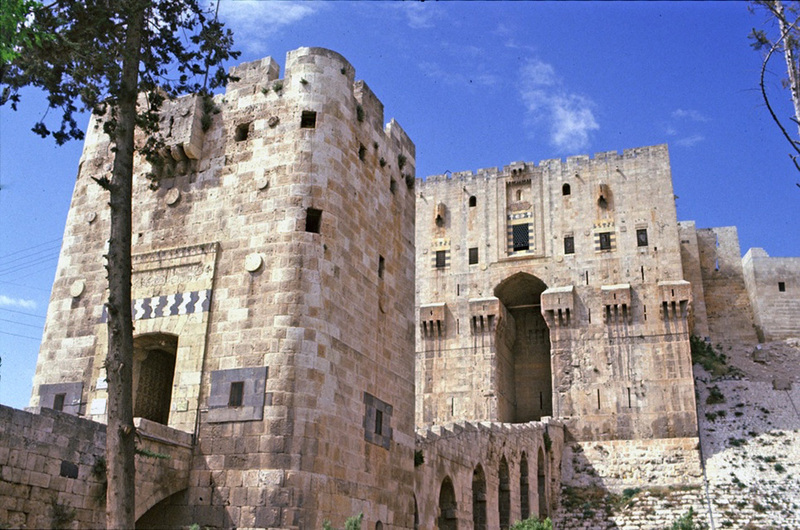 At the foot of the entrance gate to the Aleppo Citadel stood an array of buildings that dated back to the great works of the city’s Ayyubid rulers at the peak of the Islamic confrontation with the Crusaders. Other buildings in the area commemorated the early Ottoman presence in the city, which they sought to promote as the first stepping stone on the route of the Hajj pilgrimage. In this zone, nine or more “tunnel bombs” were set using cavities excavated to secrete huge explosive caches under selected buildings. The effect of these massive detonations was usually enough not only to reduce a building to rubble but also to pulverize its remains into a heap of powder. One of the first targets was the Ayyubid madrasa, used as a burial place of a son of Saladin, al-Zahir Ghazi. Ghazi was one of the most successful of the Ayyubid rulers and was appointed by his father as his lieutenant in Aleppo where his wise rule (and the subsequent management of the transition to his young son) was greatly influenced by his wife, Dayfa Khatun. Dayfa Khatun herself sponsored some of the most notable pious endowments in the city. Another casualty in the zone was one of the first works built by the famed court architect to the Ottoman ruler, Suleiman the Magnificent, in the 1530s. One can only marvel that the backers of Islamic Front were prepared to see their funding used over a period of many months to destroy such great landmarks of one of the great cities of Islam. The whole zone beneath the Citadel, beautifully landscaped with funding from the Aga Khan Trust just before the 2011 conflict broke out, is now reduced to a wasteland. 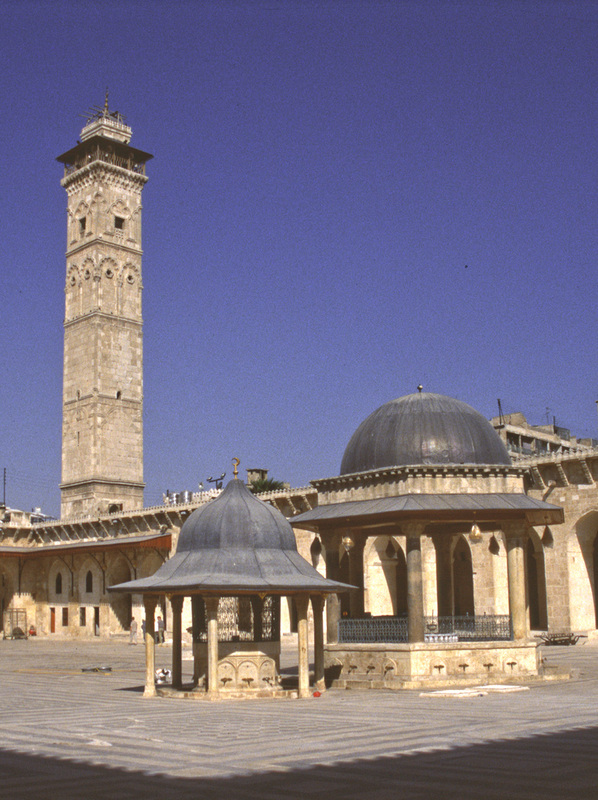 If there is one building, though, that shows how some of the most precious of Aleppo’s symbols as a great center of Islam have been lost, it is the minaret of the Aleppo Great Mosque. The mosque itself had already been seriously damaged in intense clashes that resulted from rebel forces occupying positions in this area, seeking to challenge the official forces in the Citadel. One of the rebels’ most prominent firing points was the Great Mosque’s exceptionally beautiful 45-meter-high minaret. 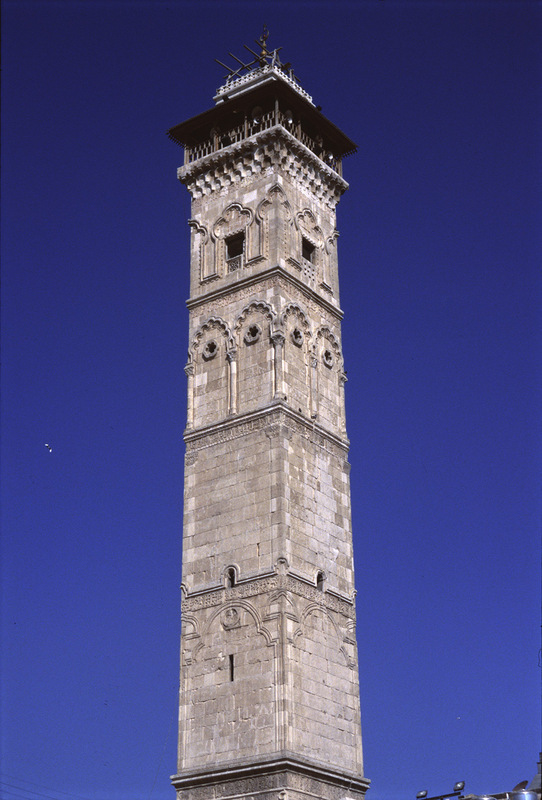 The only building in Syria that dates from the years of Seljuk rule in the late eleventh century, the minaret fell, probably as a result of heavy artillery or tank fire, in April 2013. Though many other minarets of the city center also suffered partial damage, the total collapse of this building has left a singular gap in the country’s architectural record. Gone is a building representing a stunning blend of the influences that played across northern Syria over the centuries, from Byzantium to the Crusades. It would be wrong to give the impression that these two cities suffered immeasurably greater physical damage than others. They do, however, represent a particularly harsh concentration of destruction of buildings of great historical significance and a demonstration of the determination of the conflict’s participants to let nothing stop them achieving their ends. Across Syria, much of the pattern of destruction, though, represents the haphazard choice of historic sites as zones of conflict, not necessarily as targets chosen for specific ideological reasons. Given the country’s dense network of sites of all periods and the arbitrary way in which the conflict has spread across Syria, few areas (except those firmly held by the government throughout the conflict) have been spared. It should be remembered, however, that the civilian population and housing have been much more directly targeted for destruction. It would therefore be unfortunate to see Syria’s monuments as treasures that should be selectively protected when virtually the whole population of the country finds itself at risk. However, it can be said that the preservation and restoration of historic sites and buildings will be an important element in the country’s eventual reconstruction, reviving an important revenue-generating asset and as a means of reminding the world of the complexity of Syria’s many faiths and ethnicities. Only by embracing this complex vision again, instead of the “year zero” that IS would encourage, can a viable Syria be restored. Meanwhile, we can only be patient. Archaeological zones can’t be ring-fenced from the rest of Syria and preserved. The best role for outsiders is to preserve for dissemination as much of the records of Syria’s past as has been acquired in foreign reserves and museums. Nothing should be held back as a revenue stream on the pretext of copyright. Syria has recovered from comparable disasters over many centuries (though none was waged with quite the same intensity and spread as this one). Reconstruction should be part of the challenge of regenerating the whole society. The beauty of Palmyra, its temples, tombs, Arab fortress, and colonnades, cannot be conjured up in 3D models or expensive vanity projects dreamt up by foreigners. Those who can best restore its monuments are the very artisans who aided numerous restoration projects over the years using the same quarries exploited by the ancients just beyond, for example, Palmyra’s city limits. Virtually all the monuments IS destroyed in Palmyra were carefully recorded in recent decades by Syrian, Polish, and French researchers. Their publications and records exist. We don’t need “virtual” reconstructions whose authenticity will soon wear thin. The town is as old as eternity yet it has never ceased to renew itself…. When its kings depart, this wondrous city remains; they perish but the city survives. This post is part of the series Ancient Palmyra, presenting stories and perspectives that complement the online exhibition The Legacy of Ancient Palmyra. I was Australian ambassador in Syria in the mid-1980s and have since authored three works on the archaeology and history of the country—Monuments of Syria, Damascus, A History, and Aleppo, A History. My website monumentsofsyria.com provides a comprehensive photographic coverage of the country and of the damage to its monuments.